It says something about the still-fledgling status of comics as an institutionally accepted art form that the large Moebius retrospective currently on show at the Fondation Cartier in Paris (until March 13th) is the first of its kind in France. Entitled “Moebius transe-forme,” it catches up with a metamorphosis that has been ongoing since the ’70s, marking his retardaire arrival as a fine artist in the public consciousness with all the requisite bells and whistles. Jean Giraud (b. 1938) has been drawing comic since the mid-’50s, but only in the ’70s did he diverge from the genre path to do more personally inflected work under the pseudonym Moebius, fueled in various measures by acid, weed and automatic cartooning. Although it acknowledges the first two decades of his career with a number of pages from his early Blueberry comics (including the first page of Fort Navajo, 1963), the show’s focus is unapologetically on his work since his 1973 breakthrough to the other side, “La Déviation” (an original page of which is also displayed). The show is divided into two parts, upstairs and downstairs — ce qui est en haut, ce qui est en bas — dividing it into a career overview on one floor and a section devoted specifically to the ‘trance’/’transformation’ as key motif(s) in Moebius’ art. As already suggested, the first section includes a fair amount of early work and includes a generous number of Blueberry pages spanning most of that series’ run, though with emphasis on the more recent books. One reason for this choice, surely, is that the vast majority of objects in the exhibition — curated as it is by Giraud’s wife and business partner Isabelle — are taken from the artist’s own collection, with only a few select pieces borrowed from elsewhere. In any case, only a few pages from Arzach, “The Long Tomorrow,” “Les Vacances du Major” and a couple other ’70s classics are included, and none from his greatest work Major Fatal (aka ‘The Hermetic Garage’). 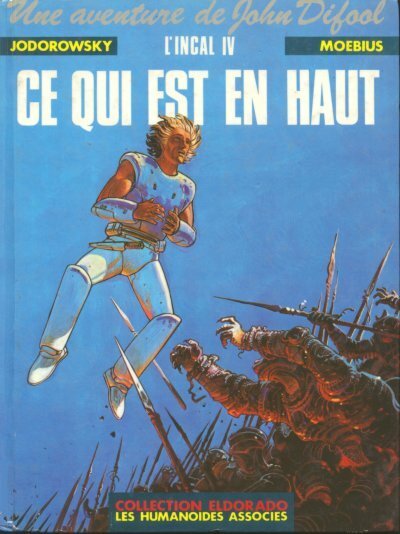 On the other hand, there is plenty from the ’80s and ’90s, including generous helpings of originals from such central works as Incal cycle and Le Monde d’Edena (as well as the sadly uninspired new Arzak book). And in a way, this deemphasis of Moebius’ most creatively fertile period only serves to underscore how protean that work was. It is the basis — conceptually, stylistically, emotionally — of everything that came since and retains a jittery life on the page unmatched in any of his later work. Thus following Moebius’ career in drawing, it is clear that his increasing mastery of line has made him nigh-incapable of the errors that were initially so integral to the Moebius approach to drawing. The occasional awkwardness, the strange disparities, the searching line they have all been integrated comfortably into his drawing, becoming part of the formula rather than fortuitous, eruptive moments of discovery. Often drawn directly in ink, his virtuosic, more recent pages have a certain alienating superficiality to them. The downstairs section, which smartly focuses on the theme of creation as change, so central to his work, contains plenty of interesting material, and some of it even of more recent vintage. It opens, deliriously, with the flip-book suite of left-hand splashes that were originally published along with the classic “The Horny Goof” (1974): a man sputteringly decomposes into clay-like putty that slowly solidifies into an enormous egg, which starts cracking even before it is fully formed, to reveal a small man — the artist? — inside. This motif of constant entropy and creation orders the entire selection, consisting of more comics pages, illustrations, concept designs, sketches, paintings, and even a couple of sculptural objects. Not everything is equally compelling here — there is a lot of material from Moebius’ rather vacuous ‘crystals and jellyfish’ phase in the late ’80s and ’90s, for example, and the paintings are unexciting — but taken as a whole it still manages to convey a sense of an exhilarating creative process relying essentially on improvisatory shaping of form. What is basically a rather precious lark provides a fine example: a ‘Martian’ bestiary crisply delineated on a hundred bible leaves showcase his abilities to riff on type — in this case a soft, amorphous form coalescing each time into slightly different, distinct matter. So while the exhibition demonstrates how crucial Moebius’ seventies revelation was to his art and career, it also shows an artist working under continuous inspiration. Perhaps most encouraging is the display of dozens of his small (A5) notational sketch pages for Chasseur déprime, his recent revival of the Garage (oddly, but surely deliberately, none of the full-size originals are exhibited). Drawn directly in what must be the smallest Rotring, they are thrilling in their freedom and awesome in their control — everything is there, including those small errors of yore, consolidating the distinct sense one gets when reading that book that it originated or enabled a process of self-rediscovery. Another transformation. For more on Moebius and especially The Hermetic Garage, see this article from The Comics Journal #300. This entry was posted on Monday, February 14th, 2011 at 12:01 am	and is filed under Review, Top Stories. Trance-form, transform — also “over form” (your “improvisatory shaping of form”) and a slight sense of “breaking the mold” (beyond form)? I wish English would do that. It looks as if that sentence could have used some copy-editing, but thanks!